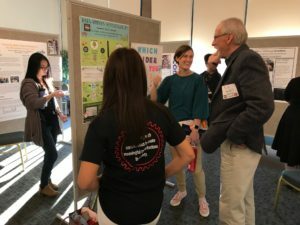 During a poster session and presentation Jan. 24, the Harvey Mudd College community celebrated its work with the broader community to educate and empower those in need and to make meaningful contributions to society. The Office of Community Engagement (OCE) hosted this fifth annual event—Voices of Engagement—which showcased the diverse community engagement efforts of Harvey Mudd students, faculty, staff and their community partners. HMC faculty learn about a student’s community engagement project. Associate Dean for Research and Experiential Learning Talithia Williams pointed out the College’s very hands-on approach to STEM education, remarking that nearly half of the student body (about 400 students) engages in co-curricular community engagement activities, amounting to about 12,000 hours of service. Vice President for Student Affairs and Dean Anna Gonzalez believes the Office of Community Engagement is an integral part of the HMC student experience. “I’d like the OCE to continue to be our conscience, to challenge us to be better, to make real the part of the College’s mission that says ‘impact the world,'” said Gonzalez. 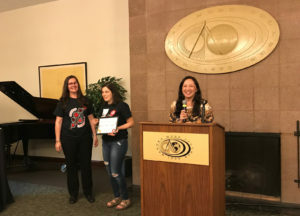 In addition to poster presentations detailing the work of a variety of organizations, OCE handed out awards to student groups and to community partners. This award recognized the organizations for their exceptional achievement and hours engaged in community service over 12 months. Arielle Isaacs ’21, co-president of MMAD, accepts the OCE award from Gabriela Gamiz and Anna Gonzalez. 5C In-Lend Fund (4,500 hours) is a student-run microfinance initiative based at Claremont McKenna College that helps low-income entrepreneurs in the Inland Empire start and develop their own small businesses. Volunteers work directly with local entrepreneurs to provide them with KivaZip zero percent interest micro-loans and free small business counseling services. Counselors work with these entrepreneurs to develop and grow their small businesses through business planning, market research, website and social media development, and other strategic advice. Mudders Making a Difference/MMAD (1,125 hours) is HMC’s community engagement club. It works with the Office of Community Engagement on a variety of projects, such as CHAP communities cafes, student care packages and the Pomona Unified School District Science Fair. The Prison Education Project/PEP (1,064 hours) gives Harvey Mudd students the opportunity to teach STEM subjects at local prisons to educate, empower and transform the lives of incarcerated individuals. PEP at Mudd coordinates with the leaders of PEP at Pitzer College and Cal Poly Pomona and the prisons in the local area to allow Mudd students to teach at the prisons. Mudd students design curriculum and teach classes on mathematics, computer science, physics and chemistry at local women’s and men’s prisons. 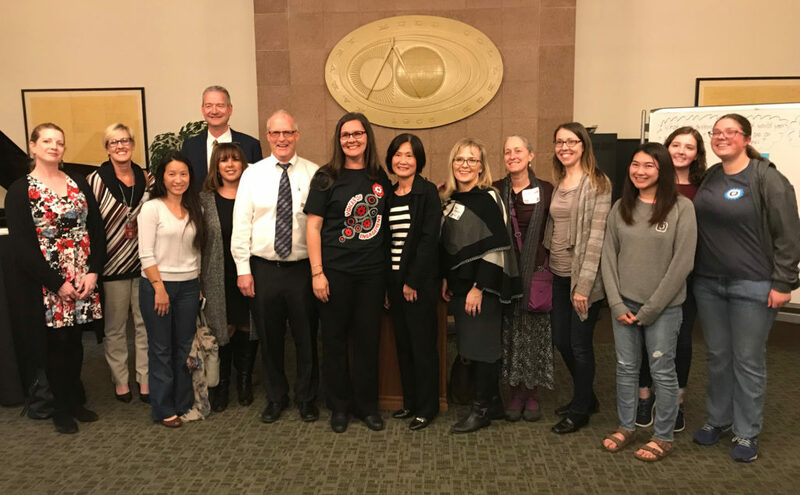 Gabriela Gamiz, director of community engagement, presented awards to two local educators who have worked alongside Harvey Mudd faculty and students on successful programs. She said, “Our community partners have helped us develop, implement and assess two STEM-related initiatives within their respective schools or district. Thanks to their continuous input and commitment, these two unique and successful programs benefit numerous students, K–12 educators and families. Three to six Saturdays each semester, Vista del Valle Elementary School students participate in the Saturday STEM Academy. They meet in the school cafeteria with coaches from Harvey Mudd College, read science and technology-related stories, discuss their readings and then do a hands-on activity. The Academy started two years ago as a partnership to provide enrichment for Vista del Valle upper-grade students and work-study options for HMC students.